A few years ago, a documentary was shown on the television called 'Who is Arvo Pärt?'. Most of the coverage was fairly conventional talking heads and rehearsal footage, but it was interspersed with a man going round the streets of Tallinn, stopping passers-by to ask them 'Who is Arvo Pärt?'. And guess what, none of them had a clue. I wondered at the time what the point was of this recurring device. They weren't exactly making their subject seem any more significant by showing how little he was known in his own country. But perhaps things have changed there in the intervening years. This disc suggests as much, an all Pärt programme from an Estonian conductor, choir and orchestra, and recorded by the Estonian Broadcasting Corporation. Whatever the neglect in his home country, he has hardly been overlooked in the West, and this disc is only the latest in what is now a long discography, destined to be considerably longer by the time his 75th birthday celebrations are over next week. Both choir and orchestra are young, according to the liner most players and singers were recruited from the class of 1999 at the Estonian Academy of Music. Given their youth, their professionalism is impressive. If they don't quite reach the standards of other Pärt recordings, that is only because labels like Chandos and ECM have truly phenomenal Scandinavian and Russian ensembles to draw on. But in general, this is an ideal Arvo Pärt primer. The recording location isn't given in the liner, but judging from the session photos, it seems to be one of those plain Protestant churches you find in the Baltic countries. It has a warm, but not blurring acoustic, which is ideal. The acoustical environment is especially valuable in the passages (admittedly brief) when the orchestra plays without the choir. Pärt's music, since the 70s at least, is never more than a step removed from liturgical singing, so the orchestra heard in a church acoustic is an ideal combination. With the exception of the final Te Deum, each of the works is based on a single musical idea or texture. There is surprising variety between them. They are all unmistakably Arvo Pärt, of course, but there are many moods here. Summa, given here in the choral rather than the string version, is flowing yet serene, Ein Wallfahrtslied is questing and exploratory, albeit in an introverted way, and the Nunc dimittis is – believe it or not – outright dramatic. The closing Te Deum is by far the most substantial work. To be honest, you have to be in quite a spiritual frame of mind to sit through 30 minutes of this, although the sectional structure helps a bit. The competition is pretty strong on this work, with at least six recordings, including contributions for top Pärt interpreters Paul Hillier and Tõnu Kaljuste. The great advantage of this recording is the freshness of the young voices in the choir, or choirs rather – they are divided into three groups. Perhaps this takes us a little further from the Orthodox liturgy that the composer had in mind, but the sheer elegance of the choral tone more than makes up for that. 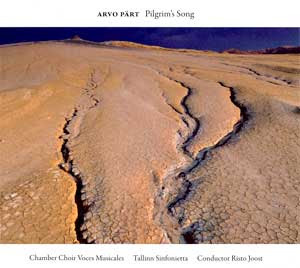 So, happy birthday to Arvo Pärt for Monday. This is as good a present as he could want for it. I doubt that any of the performers here are even half his age, so it must be gratifying for him to see his work being carried on by the younger generations. Gratifying too that Estonian performers are finally getting round to recording his music. But will it make him a household name among the residents of Tallinn? I'm not holding my breath.